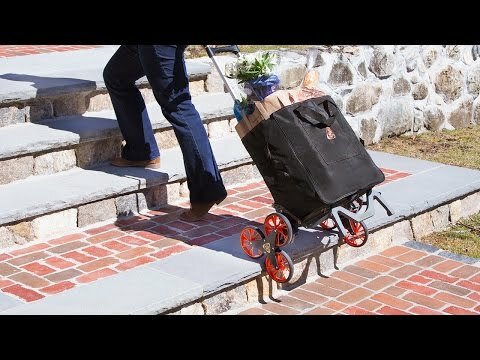 This three-wheeled, all-terrain folding hand truck can haul a 125-pound cabinet up and down your stairwell. The optional ripstop-lined nylon bag holds up to 20 gallons. UpCart folds down to just over four inches for super easy storage. Any time you need an extra hand, this helper is ready. Dimensions: 15" x 18" x 11"
Whether it's heavy boxes, extra large bulky dog crates, or tall tippy plants, I have moved them all easily up or down the five stairs leading up to the house.